Born to a family of shoemakers, Aiko Miyauchi has a natural ability for making things. Her love of colors, circles, cells, and foliage are reflected in the embroidery work she does . Using various types of thread, beads and glass, she always tries to bring out the best in the materials she uses. Aiko's embroidery is based in Asian and South American styles while at the same time incorporating many other concepts from around the world to create a new and unique brand of her own. Learns chain stitching from a friend while studying Yoga in India. Becoming completely absorbed in embroidery, she travels to Gujarat in Western India and acquires more knowledge about Indian needlework. Travels to the Philippines on a volunteer program with JICA. Takes part in a project that focuses on creating both art and consumer products with Abacá (Manilla Hemp). 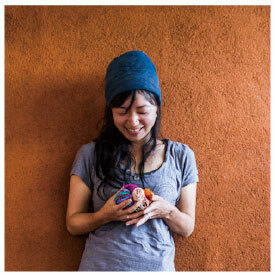 After returning to Japan she delves into making Mandalas. Releases her first original brand "tsunagaru-te" and starts distribution. Completes six Mandalas the same year. Feeling a need to establish more and wide based knowledge of colors and patterns, Aiko takes a trip to Guatemala and Mexico. Returning to Japan, creates a base of operations for her embroidery enterprise in Uji, Kyoto. Starts a regular workshop called "Nuu no Jikan" (Time to Stitch). Begins doing workshops throughout Western Japan. Holds her first exhibition, "Aiko Miyauchi Needle Work Exhibition” at дача in Joyo, Kyoto. With the renewal of her homepage she has created yet another new brand; "colorcle" which combines the themes of "circles" and "colors”. She hopes to continue creating new products and doing workshops with the same energy she had when her embroidery adventures started almost ten years ago.